Since its launch on September 12, 1991 from the Space Shuttle Discovery, the Halogen Occultation Experiment (HALOE) has been collecting profiles of middle atmosphere composition and temperature on board the Upper Atmosphere Reseach Satellite (UARS). 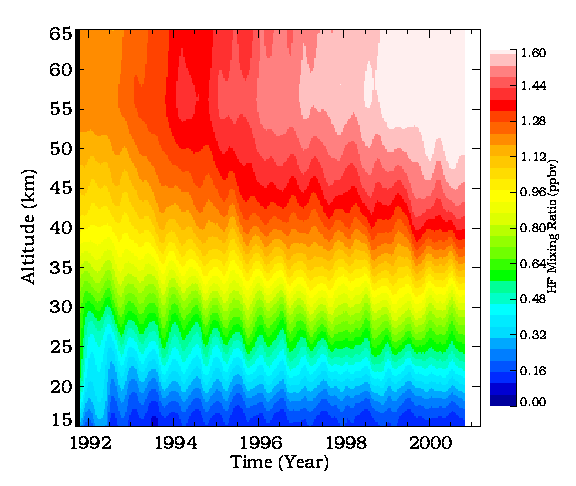 HALOE uses solar occultation to measure simultaneous vertical profiles of Ozone (O3), Hydrogen Chloride (HCl), Hydrogen Fluoride (HF), Methane (CH4), Water Vapor(H2O), Nitric Oxide (NO), Nitrogen Dioxide (NO2), Temperature, Aerosol Extinction at 4 infrared wavelengths, Aerosol composition and size distribution versus atmospheric pressure with a 1.6 km instantaneous field of view at the Earth's limb. Aimed at better understanding the coupled chemistry, dynamics, and energetics of the Earth's middle and upper atmosphere, HALOE was selected to fly on UARS supported by the NASA Mission to Planet Earth program. HALOE is a collaboration among the Langley Research Center; Max Planck Institute for Chemistry; University of Chicago; University of Michigan; University of California, Irvine; NOAA/Environmental Research Laboratory; and Imperial College, U. K. Fabricated and calibrated in-house by engineers at NASA Langley Research Center, the over 14 years of flawless operation of HALOE is an icon of their dedication and committment to quality. Dr. James M. Russell III from Hampton University in Hampton, Virginia is the HALOE Principal Investigator. The HALOE Project Scientist is Dr. Ellis E. Remsberg located at the NASA Langley Research Center in Hampton, Virginia. Larry L. Gordley, Gats Inc., Hampton,Va. W. Donald Hesketh, SpaceTec Ventures Inc., Hampton, Va.